I posted these on Instagram and they got a moderate amount of attention, so I picked all three up to review...and then didn't review anything for, like, a month. (Or two.) What can I say, I sucked at blogging in 2017. I debated on saving these for a #tbt post, but they're still available at my local Aldi, so I might as well share my thought in case any of you have been wanting to check these out before they disappear. Visually, these are looking pretty Trader Joe's-y. 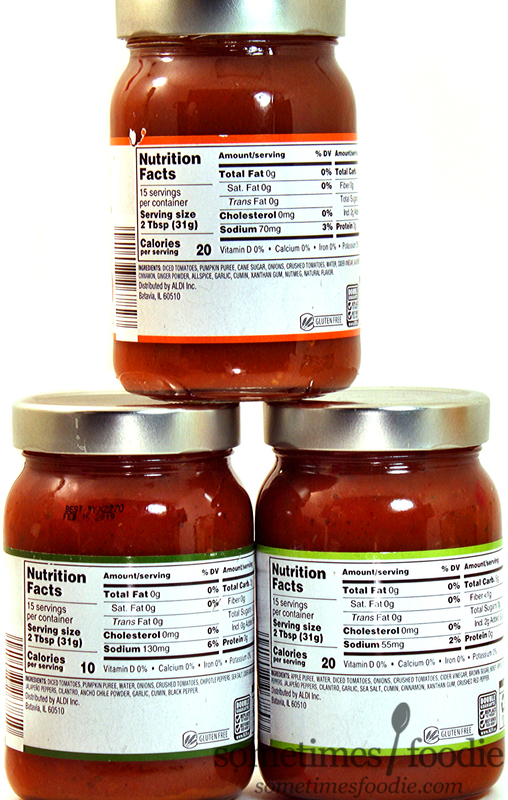 We have glass jars with off-white labels and anachronistic labels featuring both modern and retro design elements. I actually like this packaging a lot, because it feels much more high-end than it really is, but my only gripe the the type-faces look so jittery. I have a graphic design and digital printing background, and to me, it just looks like on the the colors/plates was slightly off-center during the printing process, but maybe they were going for that double-vision look? Intentional or not, I find it annoying to look at the text on the labels for too long. 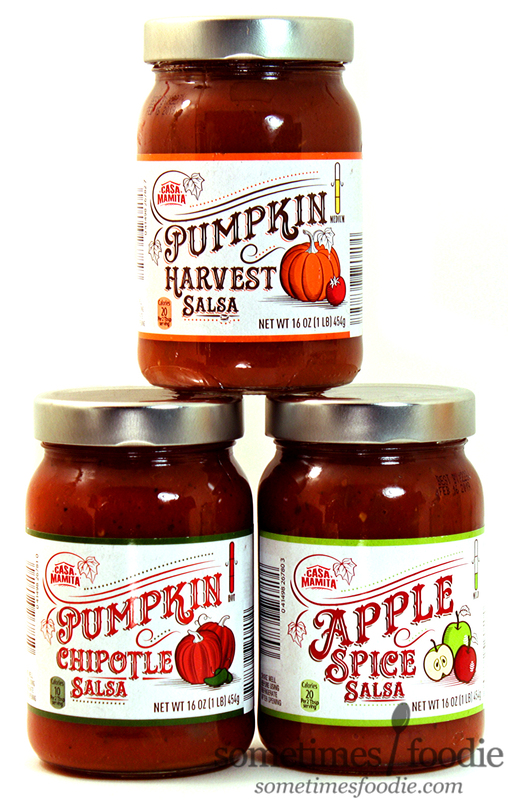 We have three different fall-inspired salsa flavors, each with tier own spice level, so let's just jump right in and start with the spiciest flavor and work our way down! Spiciest: Pumpkin Chipotle - This salsa has a sweet, but earthy, aroma that's more sweet than spicy, which makes me nervous. This is supposed to be the spiciest of the bunch, and if this is a dud, the others must be pretty wimpy. I can smell sweet pumpkin and tomatoes, onions, garlic, and dry roasted peppers which have a smoked quality, but no detectable heat. I grabbed a tortilla chip and gave it a try. Thankfully, it's not bad. This is significantly more savory than I expected, and it has a dry chipotle kick that hits you right in the back of the throat. I wouldn't say that the heat-level is worthy of the "hot" rating on the jar, but it is build-able, and even after just one bite I can promise you, this salsa will take you right to heartburn city. I can feel it coming already... 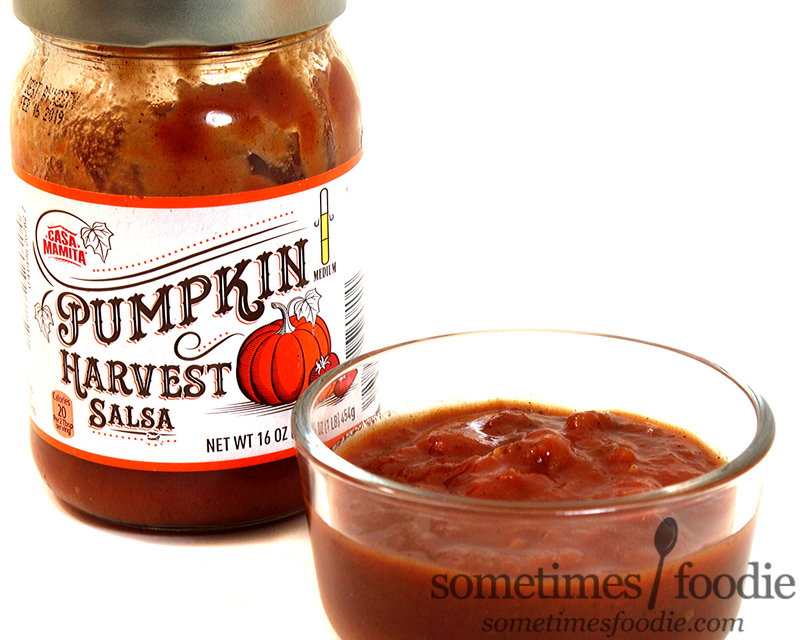 In the end this is a spicy, smokey, salsa with a prominent pumpkin flavoring that makes it quite festive for the fall, but it doesn't taste so great that I would want to eat it year-round. Medium: Pumpkin Harvest - Oh, wow. I'm 95% sure this is a re-packaging of the pumpkin salsa I reviewed several years ago. I was a big fan of it then, because it broke up all the sweetness of other pumpkin products and was rather unique, but now the shine has worn off and I find it less appealing. 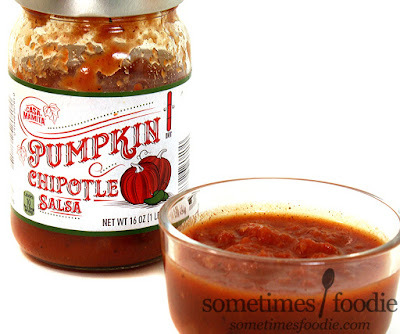 Imagine taking pumpkin pie filling, mixing it with taco seasoning, and eating it with chips. Not the worst thing in the world, and could be fun for a seasonal snack, but the flavors aren't a perfect mash-up that can overcome the seasonal divide. I grabbed a chip and took a bite, and I can now say I'm 100% sure this is the same salsa I remember. It's sweet,with a decent amount of savory seasoning mixed with cinnamon, nutmeg, and jalapeno peppers. 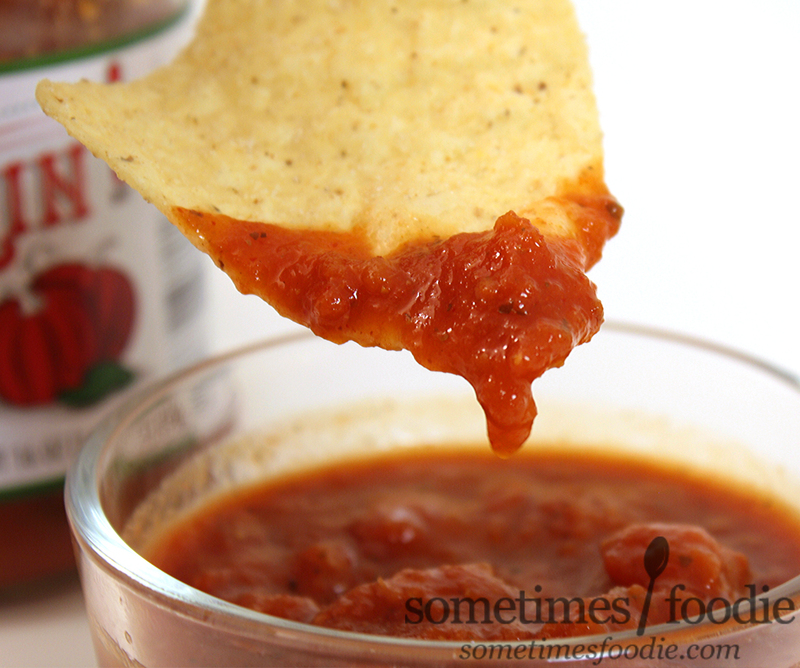 The pumpkin-y part of this salsa is mild enough to let you get away with using this on nachos and tacos without giving your off-season-self away, but it's a pretty sweet profile that might not appeal to all palettes. 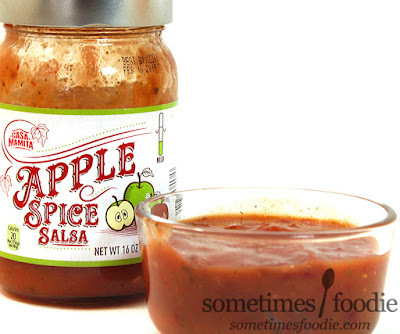 Mild: Apple Spice - A refreshing pumpkin-less fall offering, and a welcome breathe of fresh salsa-flavored air. I gotta say, I'm pretty over pumpkin these days, so this is the flavor I am most excited about. I opened the jar and I can smell apples, cumin, onions, tomatoes, liquid smoke. I'm hoping this will be a light and refreshing option that would taste great on top of fish dishes, almost like mango salsa. I grabbed a chip, took a bite, and...it's crazy sweet. Pretty much applesauce-level-sweet, but with a savory after taste of tomatoes and onion jelly. Of the three, I think this has the most interesting profile, but I gotta say, it's not great with tortilla chips. I don't like this one as much as I thought I would, but I can see several cooking applications for it. In the end, the medium Pumpkin Harvest salsa, which I may or may not have reviewed before, is my favorite overall in terms of flavor. I like what the other two flavors bring to the table (variety and different heat levels), but they just aren't as snackable and versatile. The flavors are very season-specific, and are too intense to work in most general applications without being too pumpkin-y or (in apple's case) overly sweet. These jars have been open and fair game in our fridge for quite some time, and I'm the only one who reaches for them, and they're still on the shelves at my local Aldi, so I think that says all you need to know. These are a fun fall novelty and not much else. If you're only going to pick up one flavor, go with the medium. You can always make that more spicy or sweet to suit your needs/tastes, the others just have too specific a flavor profile to appeal to a general audience.